Perfectly situated in close proximity to Mitchell Falls beside a delightful waterhole on Camp Creek, Mitchell Falls Wilderness Lodge is the ideal base for exploring some of the region's most unforgettable attractions. APT Wilderness Lodges offer a touch of luxury in the heart of the wilderness. Eliminate the hassles from your self-drive Kimberley adventure, staying in a twin tented cabin complete with spacious ensuite, hot shower and flushing toilet. A private front deck, is the perfect place to relax at the end of the day. The stunning Ungolan Pavilion completed in 2015 raises the bar for remote accommodation once again, fusing modern Australian, local craft and Indigenous influences. It includes a lounge, bar, library and dining areas as well as a commercial kitchen to provide an even higher level of gourmet cuisine. 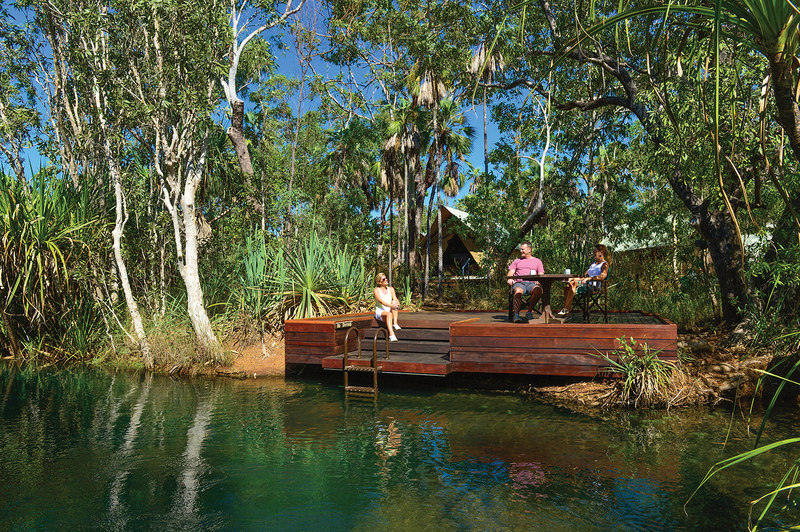 A deck offers easy access to the Lodge's private waterhole. Enjoy open-air dining with the freshest of local cuisine prepared by our expert chefs. A three course set menu dinner and full breakfast are included with your stay. Our lodges are licensed and provide a select range of beers and Margaret River wines for purchase. Our welcoming Lodge hosts are always on hand to help in any way and offer their knowledge of the region. The Wunambal people welcome visitors to Ngauwudu (Mitchell Plateau), where you'll stay at Mitchell Falls Wilderness Lodge,close to the spectacular Mitchell Falls. Perfectly situated beside a delightful waterhole on Camp Creek, you can relax on the deck and enjoy a cooling swim. Guests have the unique opportunity to explore the lodge's untouched surrounds and stroll through the Livistona palms and eucalyptus trees. 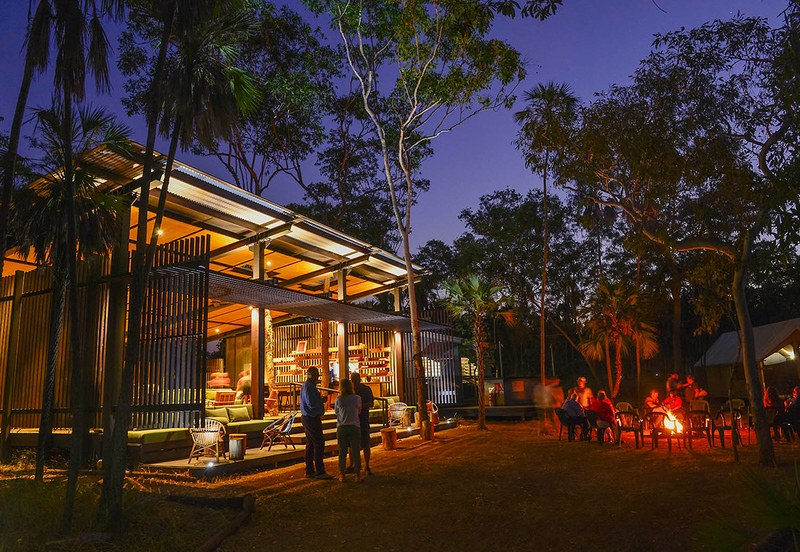 The new Ungolan Pavilion at the Lodge, opened in 2015 is architecturally designed and fuses modern Australian, local craft and indigenous influences. Features include a lounge, bar, library and dining areas. The Pavilion raises the bar for remote accommodation once again. Featuring just 24 Standard tented cabins with twin beds, our exclusive Mitchell Falls Wilderness Lodge offers you truly intimate, private accommodation in the wilderness. Sit back and relax on your private deck and soak up the tranquil surrounds. With chefs at every APT Wilderness Lodge, we strive to make dining one of the highlights of your experience. Included in the rates are a superb three-course dinner, with a hearty full breakfast each morning. Arriving via the remote Kalumburu Road, you'll enjoy a truly memorable journey past breathtaking scenery and rare and extraordinary Aboriginal art. 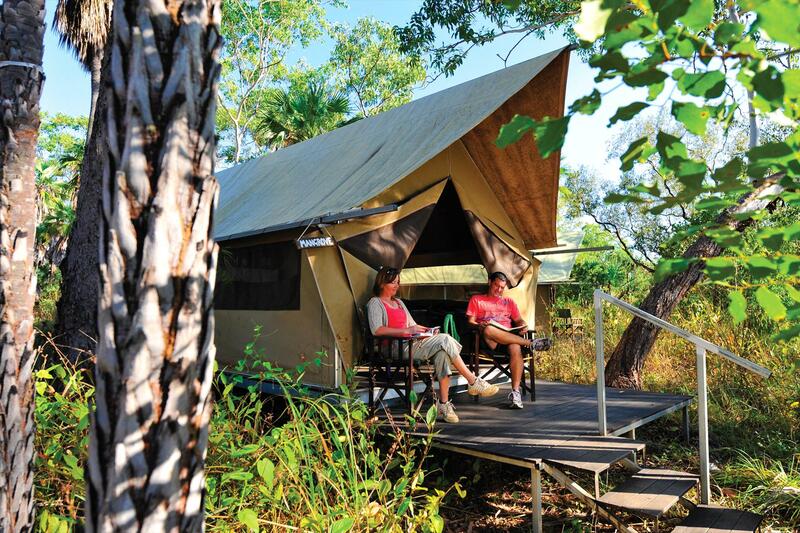 The Lodge is the perfect base to explore some of the Kimberley's most spectacular scenery. Take the Kalumburu Road turnoff from the Gibb River Road. • Travel 59km to Drysdale River Station,which will be the last fuel stop before travelling to the Plateau and provides meals and snacks. • From Drysdale travel a further 100km to the Mitchell Falls turnoff (on your left hand side). • Cross over the King Edward River crossing and continue travelling towards the Mitchell Plateau Airstrip. • It is a further 65kms, approximately 2 hours drive, from the turnoff to Mitchell Falls WIlderness Lodge. • When you pass a sign to Kandiwal Community on the left, continue for another 4kms. • Turn left into the Lodge private road at the APT Wilderness Lodge sign. • Travel down the private road 1.8km to the Lodge to the Visitor Carpark on the left. Mitchell Falls Wilderness Lodge boasts minimal environmental impact - giving guests the unique opportunity to be surrounded by untouched habitat. 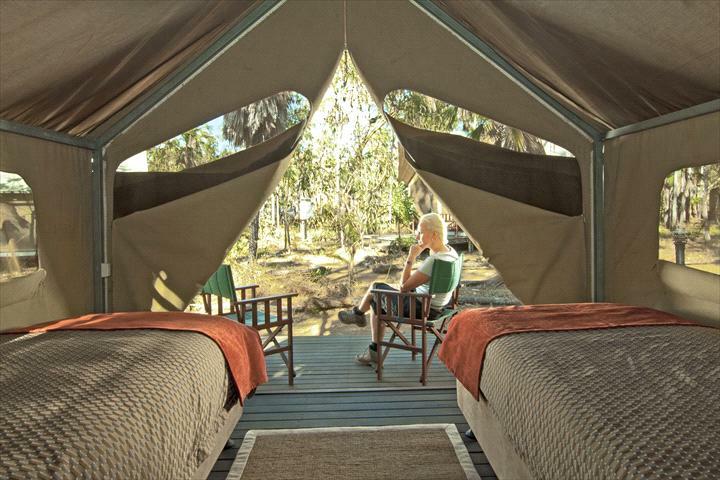 Enjoy tented cabins which feature ensuites, fresh linen and solar powered hot water. Stroll through the Livistona palms and eucalyptus trees, or cool off at the lodge waterhole. The accommodation rate for children applies solely to children under the age of 15 years. The accommodation rate for children applies solely to children 3-15 years. Tented Cabins with ensuite and private deck. Rates incides 3-course dinner and full breakfast daily. Lunch is available by prior arrangement for $25pp. This general information relates to Australian Pacific Touring Pty Ltd herein after referred to as ?The Company?. Full payment is required at confirmation of booking. All fares quoted are in Australian currency and supersede all prices previously advertised. Twin share prices are per person unless otherwise stated. The Company reserves the right to cancel bookings or to refuse to accommodate any passenger where payment has not been received by The Company within the specified time. Prices include Australian Government Goods and Services Tax. 1. The Company accepts no liability for any loss of enjoyment experienced by passengers due to circumstances beyond its control. The Company further accepts no liability for any loss beyond its reasonable control and provides no warranties in addition to those set out under the Trade Practices Act 1974 and nothing herein restricts any passenger from exercising their rights and remedies pursuant to law. 2. No passenger will be permitted to enter or remain at camp while their mental or physical condition is in the opinion of any representative of The Company such as to render them incapable of caring for themselves or whereby they become objectionable to other guests or they become a hazard to themselves or other guests. The Company will not be responsible for expenses resulting in such persons being precluded from completing their stay. 3. Camps are open between April/May and October. We reserve the right to amend opening and closing dates at any time. Any additional expense incurred by the passenger is not The Company?s responsibility. A charge of $70 per person will apply to any addition or modification requested after the original booking has been confirmed.